The gross appropriations figures for this section are derived from Erin Black, Myron Freeman, and Tumai Burris, House Fiscal Agency, “Line Item and Boilerplate Summary,” Fiscal Year 2002-2003,” Dec. 2002, p. 1. Act No. 519, Public Acts of 2002, p. 1. U.S. Census Bureau web site, “Profile of General Demographic Statistics,” accessible on the Internet at http://censtats.census.gov/data/MI/04026.pdf. The Skillman Center web site, “From A Child’s Perspective,” accessible on the Internet at www.skillmancenter.culma.wayne.edu/Children%20and%20Policy.htm. Negative Population Growth web page, “NPG State Facts,” accessible on the Internet at www.npg.org/states/mi.htm. Don Mathews, “The Free Market Lifts All Boats,” The Chalcedon Report, June 1997, accessible on the Internet at www.chalcedon.edu/report/issues/97jun/mathews.php. Act No. 529, p. 2. Goodwill Industries of West Michigan web page, “Employment and Training Services,” accessible on the Internet at http://www.goodwillwm.org/. Michigan Family Independence Agency web site, “History,” accessible on the Internet at www.michigan.gov/fia/0,1607,7-124-5459_7342_7928-15801--,00.html. 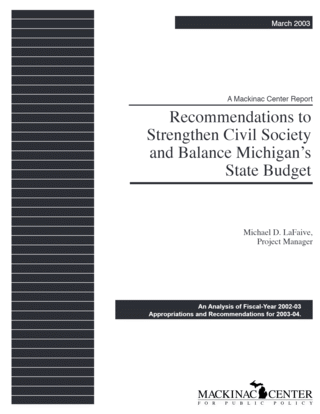 Policy Analysis and Program Evaluation Division Budget, Analysis and Financial Management Administration, Michigan Family Independence Agency, “Program Descriptions FY 2003,” Nov. 2001, p. 88. Refugee Development Center web page, “What is the refugee center?” accessible on the Internet at www.refugeedevelopmentcenter.com/. Angel Fire web site, “Available Resources to Help Defray or Cover the Expense of Adoptions,” accessible on the Internet at http://www.angelfire.com/journal/adoptionhelp/adopthelp.html. Act No. 529. Page two listed an appropriation for this program of $14,600,400. The figure was decreased due to a partial veto by Gov. Engler, and is reflected in the program line item in this chapter. Michigan Family Independence Agency web site, “Support Services,” accessible on the Internet at www.michigan.gov/fia/0,1607,7-124-5452_7116-22559--,00.html. Act No. 529, p. 3. Act No. 529, p. 4. Policy Analysis Program Evaluation Division Budget, p. 6. Ibid. Page four lists an appropriation for this program in the amount of $45,187,100. The figure was increased due to the July 2002 cigarette tax increase, and is reflected in the program appropriation amount in this chapter. Policy Analysis Program Evaluation Division, p. 16. Home Repair Services web page, “Programs,” accessible on the Internet at www.homerepairservices.org/programs.html. Act No. 529. Page four listed an appropriation for this program of $466,910,000. The figure was decreased do a partial veto by Gov. Engler, and the new figure is reflected in the program line item in this chapter. Policy Analysis Program Evaluation Division Budget, p. 20.